Compsognathus, first found in Germany, was about the size of a house cat. It had long back legs, short arms and a long tail for balancing while running. Apparently Compsognathus liked to eat lizards, because a lizard skeleton was found in the abdominal cavity of a Compsognathus fossil. One of the most interesting things about this creature is the debate about whether it is a predecessor of Archaeopteryx. Supporting the theory is the fact that the bone structure of Compsognathus is quite similar to that of Archaeopteryx, and the two dinosaurs were about the same size. 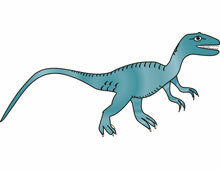 They also lived at the same time in history, which would have made it difficult for Compsognathus to be an ancestor. It is still possible, though, that Compsognathus lived earlier than Archaeoptyeryx. On the other side of the argument, Compsognathus had hollow bones, like modern birds, but Archaeopteryx had solid bones. Another objection is that Compsognathus doesn't have a collar bone, and many scientists believe birds' wishbones must have evolved from an animal with a collarbone. But while Compsognathus didn't have a collar bone, perhaps one of its relatives did.